Long before I got my Pugsley, which of all my Surly bikes I hands-down ride the most these days, I got a Steamroller (and a little later, a Cross Check). A mud brown, first-generation Steamroller, in fact, sold then (as now) as a frame-set only. I like to imagine that I was an early-adopter of the whole fixed-gear thing. Not true by a century or two, I know. But still, in these parts, when I bought it back in 2000, there weren't very many of us riding fixed, that's for sure. 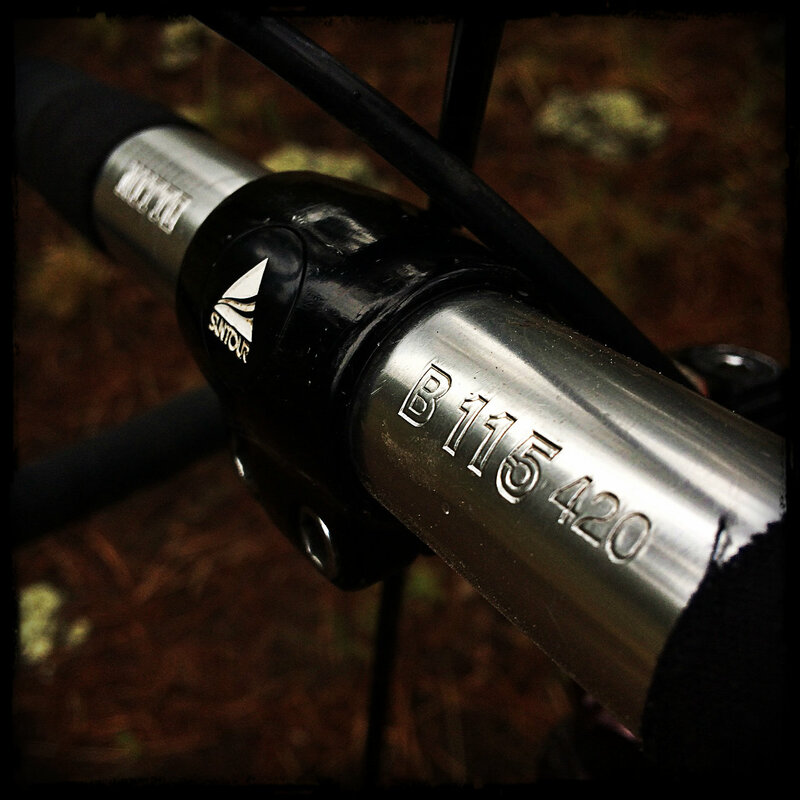 I built the bike from the ground up, including the wheels, doing what I could to emulate Rivendell's whole older-is-often-better ideal wherever I could along the way. So I've procured a few choice parts for it over the years: high flange silver Suzue track hubs, silver Nitto B115 bars, black cotton Velox bar tape and end-plugs, a black Suntour XC stem, a black IRD seatpost, a black Chris King 1" 2-nut headset, leather hub-shiners, non-aero Dura Ace brakes and levers, and a set of purple Cook Bros. cranks (a gift from an old friend). I also drilled and plus-nutted a second bottle cage mount into the downtube, just because we had the template for doing so at the bike shop where I was working that summer. The rear hub flip-flops, but I usually run it fixed, even though I always keep two brakes on it, because if I ride it I'm probably going to ride it in the woods. 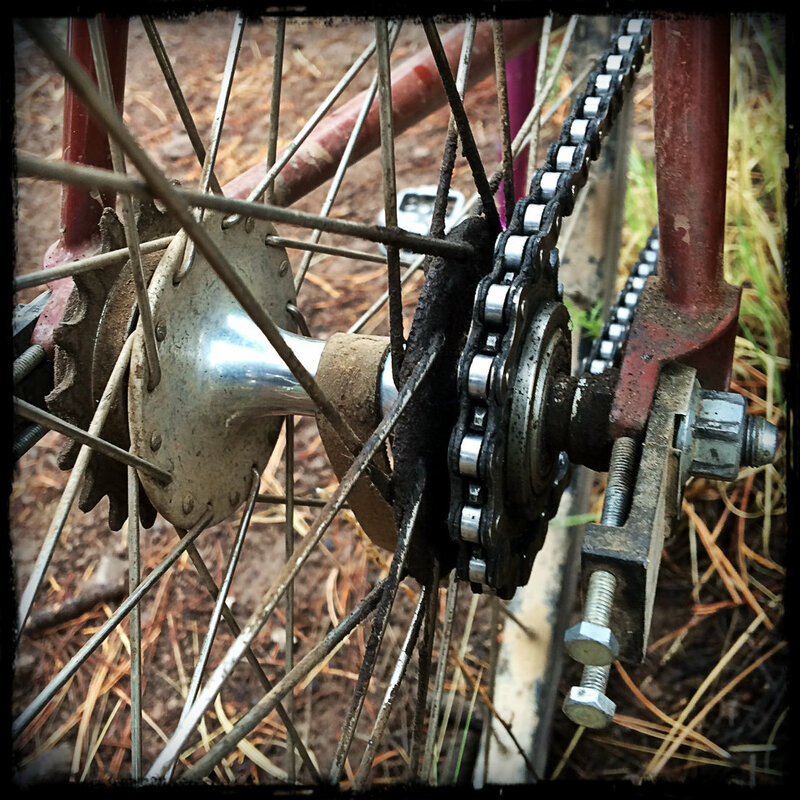 And, trust me, two brakes are better than one when you're riding a fixed gear bike on Conti Top Touring 32s out in the woods. I rode the Steamroller a lot back in the day, when it was pretty much my only "road" bike. Centuried on it a couple times, and took it on some pretty fun, gnarly, long forest road-and-trail rides, too. We call them gravel grinders now. Back then they were just rides where we took the wrong bike out on a long ride and had a blast. Sad thing is, I hardly ever ride the Steamroller anymore. It tends to get forgotten, gathering dust as it hangs from the ceiling in the garage. 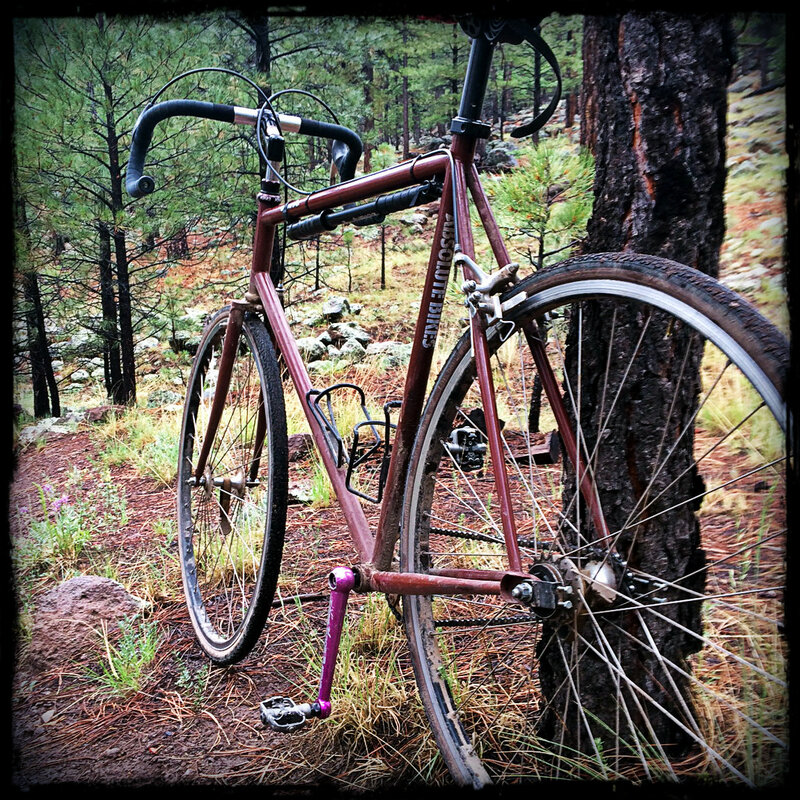 In fact, just the other night, when posting to a thread in an online forum, Post Your Steel Singlespeed, I put up pictures of my Coconino and my Rock Lobster singlespeeds and forgot all about my classic Surly Steamroller. That is until the poster who posted after me put up a picture of his Steamroller, inspiring me to: A) write this blog entry and then B) go and amend my post in the forum to include my Steamroller, too. 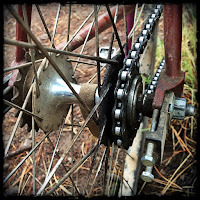 In order to do so, I rode the Steamroller out into the woods this afternoon, on a quick jaunt just after the rain stopped. 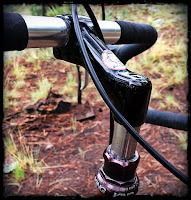 'Twas lovely out and the bike was a good and solid ride on the soft wet trails. A nice reminder of why I've always enjoyed riding it and why I should do so more often.